Good morning, This week's technique for Festive Friday is to do a project that includes a wreath. Papertrey also has a challenge #138 inlaid die cuts. I started with tag sale #4 die and stamped with versamark a pinecone from Peaceful Pinecones stamp set in a circle to make a wreath and used white embossing powder on top. I die cut using the One Lines Die the word Joy and inlaid it in the red plaid paper on the lower half of the card. Also using the Holly Jolly Die with some red bling. Below are some close-up shots. Very pretty!! 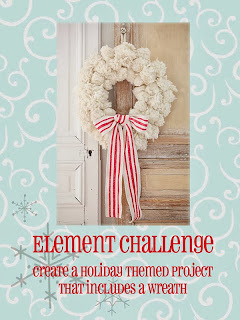 Love the white embossed wreath!! Fabulous use of the pinecone stamp, Nancy. Great mix of patterns, too. Each time I see tag sale #4 used on a card, I'm drawn in. I think it's time to move it from my wish list to my cart. Such a pretty card! Nice combo of colors and perfectly done. Oh, such a clever idea! I love how your pinecone wreath turned out! Thanks so much for joining us at Festive Friday! Oh wow, the pine cones really made a wonderful wreath! Beautiful! Thank you so much for joining us at Festive Friday! Hi Nancy...I discovered your blog through our mutual friend Marybeth. I just took a nice long look at all the great things you have created...love the halloween card and those cute Christmas trees. You are very talented and I plan to be watching you from now on, and no, I am not a stalker, just someone who loves to get inspiration from others I admire.